Cinderella brings smiles as she greets a family at Scoops Ice Cream Parlor. 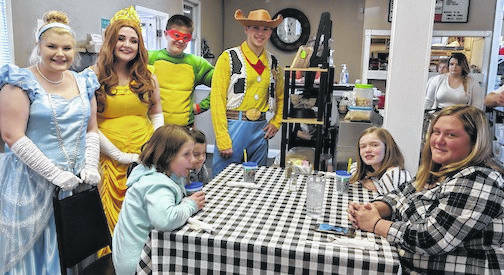 Disney characters at the Scoops grand opening include from left, Cinderella, Belle from Beauty and the Beast, Rafael from Teenage Mutant Ninja Turtles and Woody from Toy Story. Enjoying a treat are Emily Williams, Annika Burchett, Riley Williams and Jennifer Davis. 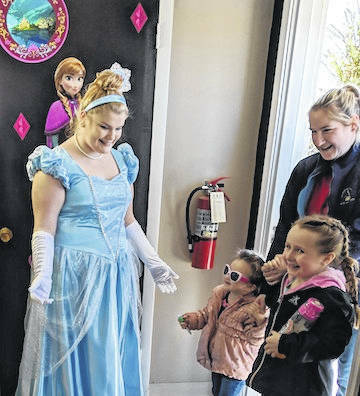 EDISON — Kaydence Williamson’s eyes were wide with wonder when she saw Cinderella and Belle in the entrance of Scoops Ice Cream Parlor in Edison on Saturday. “Scoops” is the new party venue at Edison Depot on State Route 95. Kaydence, 4, was dressed up in full Cinderella costume herself for the grand opening at Scoops. She came with her mom Danielle and grandma Sandy Williamson to enjoy lunch and ice cream as well as to meet Disney characters who greeted visitors. A steady stream of children and their families stopped in to tour the new party rooms Saturday and stop for an ice cream treat. They also came to meet Disney characters: Cinderella, Belle from Beauty and the Beast, Dorothy from Wizard of Oz, Rafael from Teenage Mutant Ninja Turtles, Woody from Toy Story and Fortnight Elf from video games. Scoops and Edison Depot owner Patty Collins was glad to see the response to the new party place and ice cream parlor. They will host princess and character parties as well as anniversary and parties for other occasions. The restaurant can supply food, or families can bring their own. There is a room decorated for both boys and girls characters and princess parties. If children or adults wish to rent costumes for a party, they have 3.000 costumes available for rental. Collins recently hosted a birthday party where the entire family dressed in Thomas Edison’s era costumes. They also have games available and welcome customers to bring their own games. Both soft serve and hard dipped Velvet Ice Cream are available with a choice of 31 toppings. Jennifer Davis said brought her daughters and a cousin. They were served ice cream on a golden tray by the Disney characters and got magical spoons for the party. To book a Character or Princess party, call Collins at 419-946-3663.